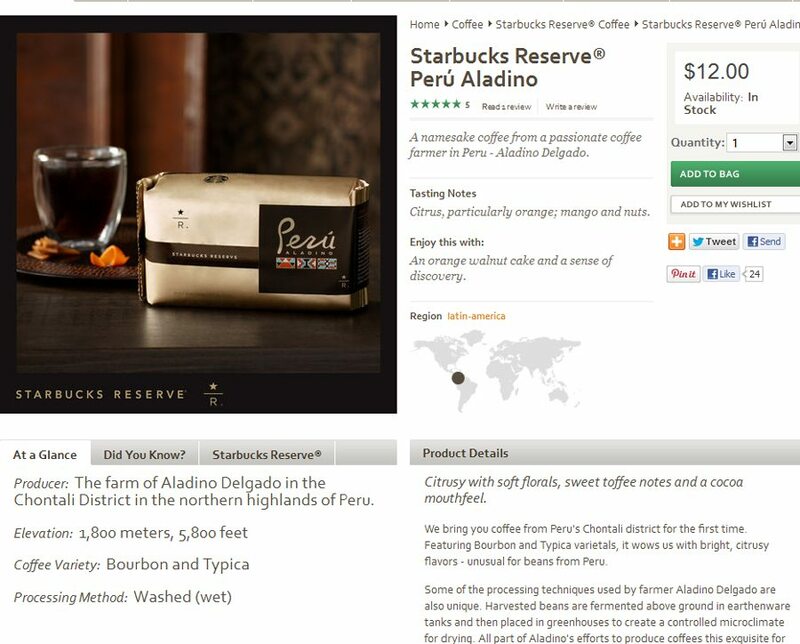 The latest Starbucks Reserve coffee is the Peru Aladino. 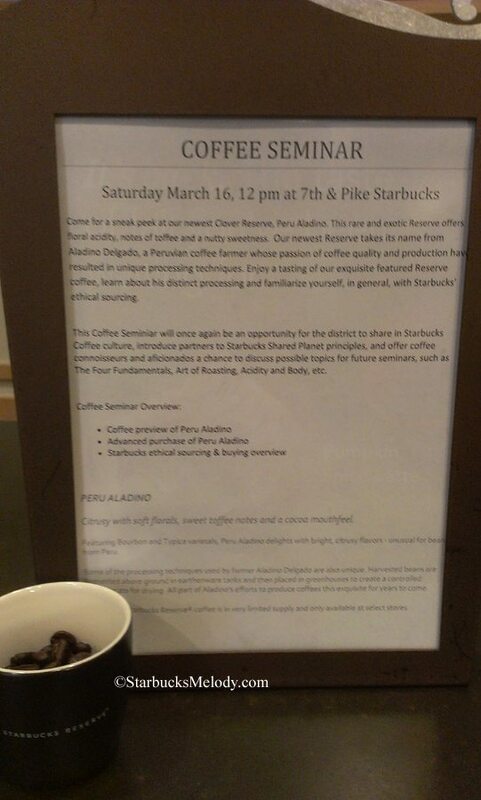 On March 16th, I went to a coffee seminar for this new Reserve (held at the 7th and Pike Starbucks) and thoroughly enjoyed the event. 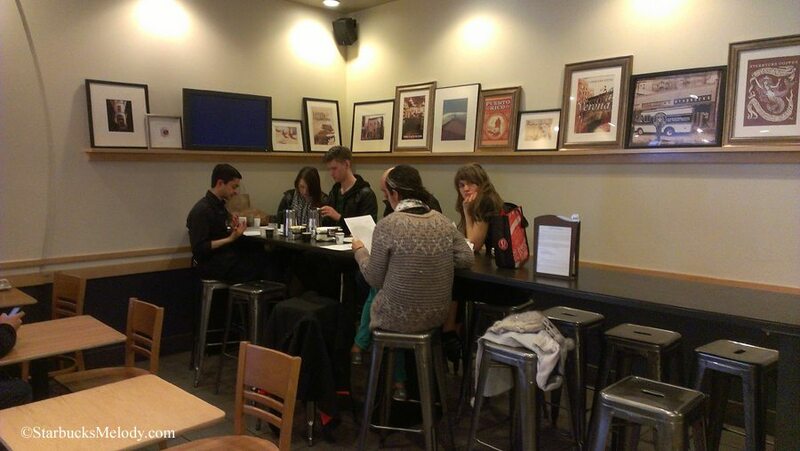 There were about six people in attendance – three were customers, and three were partners. 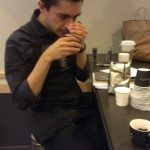 I had a lot of fun meeting another customer (Dave) who was super enthusiastic about experiencing coffee! 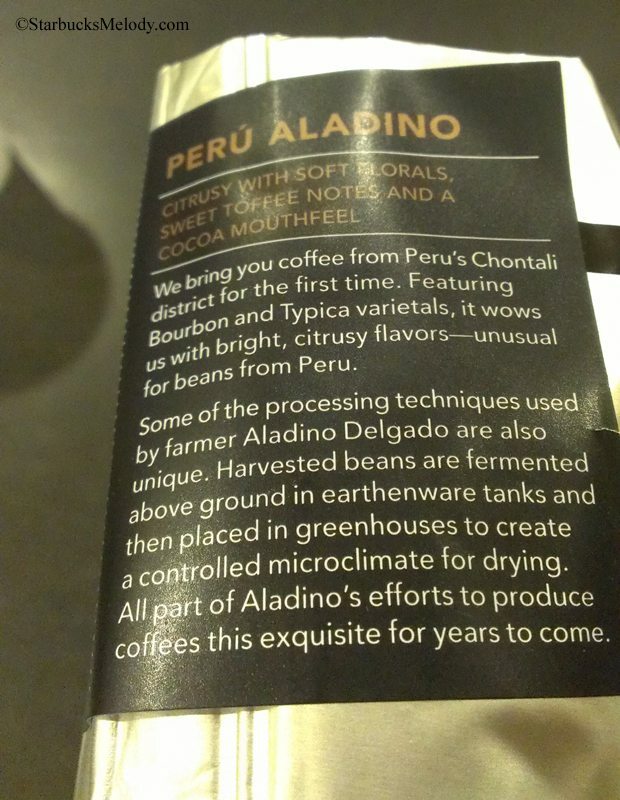 The Peru Aladino is described as having a very unique process method. The coffee farmer, Aladino Delgado, uses above-ground earthenware tanks to ferment the coffee beans, and then the beans are dried in a greenhouse. 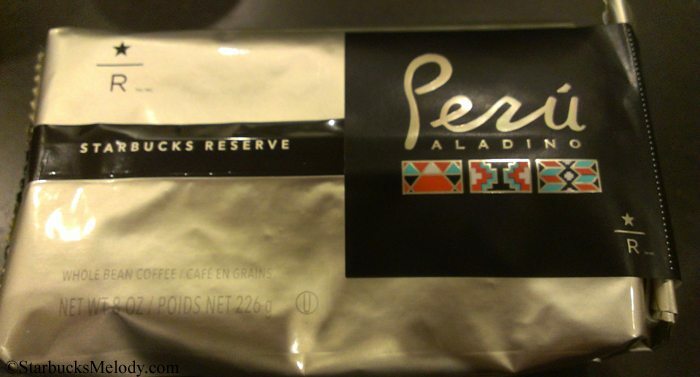 That is definitely one-of-a-kind for a Latin American coffee! 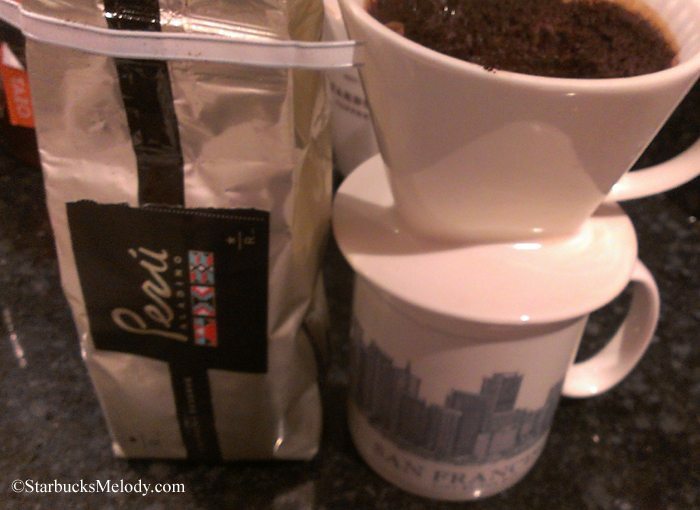 The result is a pretty bold, soft, coffee with floral and citrus notes. 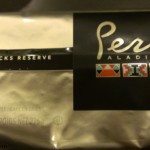 I noticed the coffee has a lingering flavor in the mouth, unlike the typical crisp and clean mouth-feel of many Latin American coffees. By the way, the aroma of the coffee beans was fantastic! 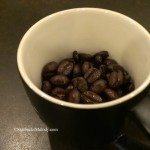 I love smelling the coffee beans! 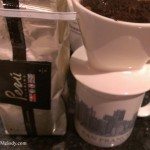 I could spend all day with my nose in bags of coffee, as silly as that sounds. 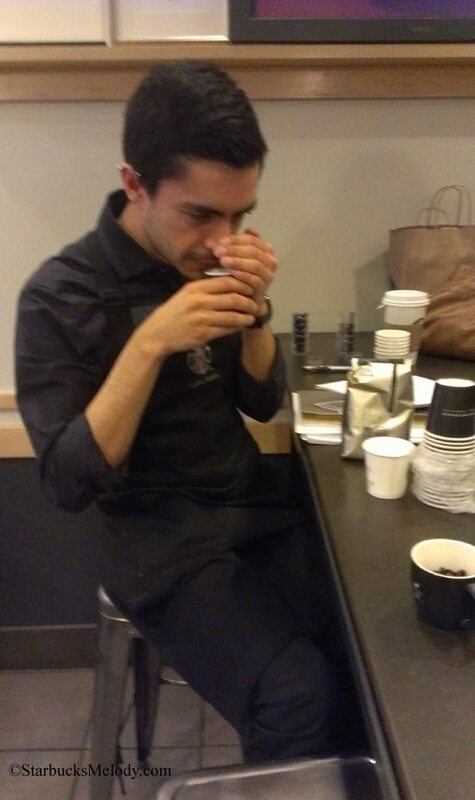 Thank you Jay for the great coffee event! 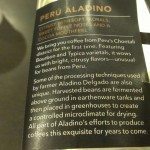 (You can order Peru Aladino at StarbucksStore.com. It’s $12 for a half pound). I liked this coffee so much that I bought a half-pound, which I made this morning through a pour over. I am drinking it right now as I put the final touches on this article! 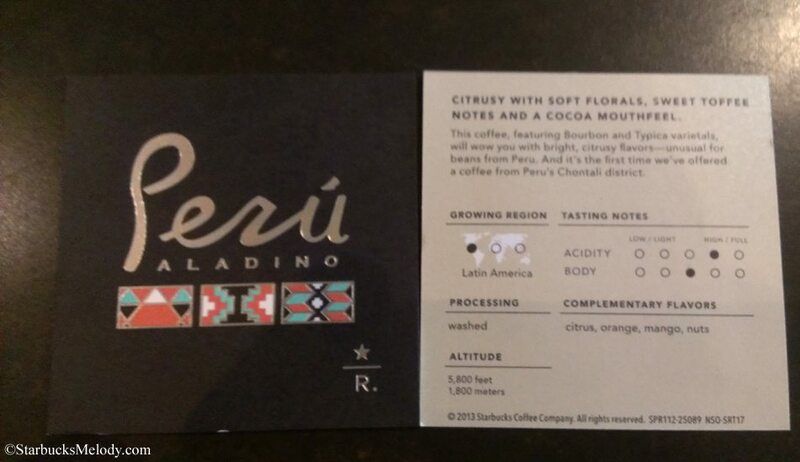 I like the soft, nutty-citrus flavor profile of the Peru! Enjoy the rest of the pictures from the event! 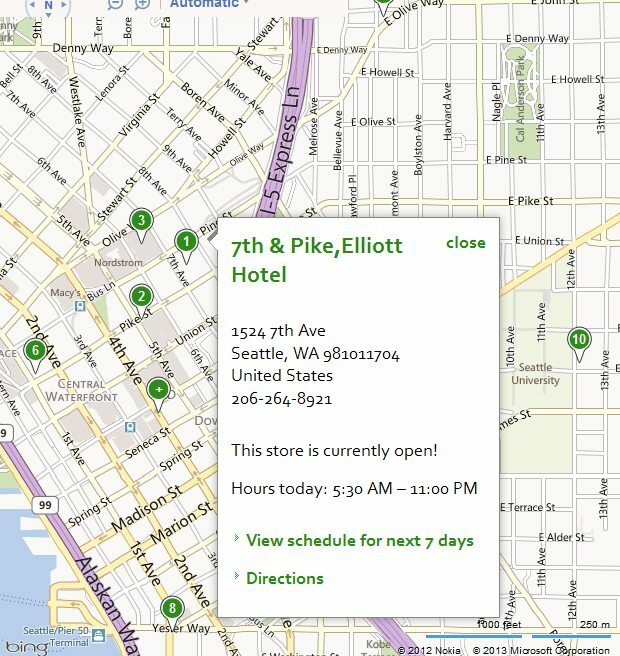 The Tazo Tea Store: Always fantastic to visit. 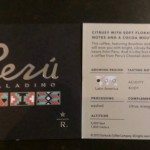 Starbucks Tribute Blend is here! Starbucks partners run to raise money for Sandy Hook victims: A roundup from the mailbag. 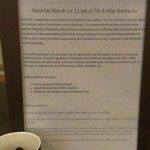 Coconut milk for your beverage at Starbucks: Beginning February 17th. A look at the top 3 ideas on My Starbucks Idea right now. 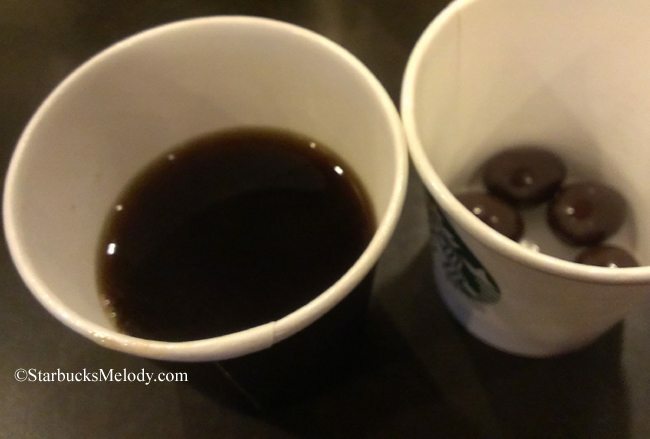 Melody, I love the chocolate covered salted almonds so I can only imagine what a nice pairing they were with the Peru coffee. You are very lucky to have the opportunity to attend these events. But we are all very lucky that you take the time to share the information with us! 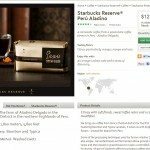 Just helps me decide on my next Starbucks purchase. Thanks again! Happy St Patricks Day to all!! I’m very excited to try this! 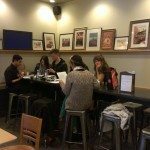 melody, thank you for always posting your experiences at these coffee tastings. i feel like i’m right there with you! Looking forward to giving this a try next weekend. We’re taking a short trip to Monterey, and since there are at least 3 Clover stores there in close proximity to our other destinations and I have 3 ready to use rewards on my Gold Card, I think I’ll get some coffee satisfaction on the trip. 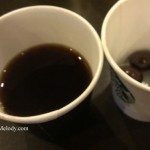 I think it would be amazing to try this coffee again with fresh oranges as the pairing. Thank you Chris, Brad, and Jocelyn – You’re helping test out my new comment system too. 🙂 I’m still getting used to it. Have fun in Monterey, Chris! Comments look good so far! Brad – Where does the blog pull the “likes” from. It says this article has 15 likes. Is that a global number? Or is that people who have read this just now, and clicked “Like”? The number on the Facebook side of the blog is much smaller. @Melody206:disqus This is reporting 15 likes for this page object (this is Facebook nomenclature). The number on the Facebook side shows likes on that post. Here, you see likes for the actual, physical webpage. There, you see likes for the post that links to the actual, physical webpage. It’s purely semantic, but those two numbers can be added together to show your TOTAL LIKES for any one post/asset. This coffee sounds like a great morning coffee to me. Thanks for sharing! My order just came in from StarbucksStore. I can’t wait to taste it! I paired my tasting with mango mousse. It was amazing!! !